The Mottled Duck is about twenty-two inches long and various shades of brown all over. A yellow bill and orange legs and feet complement the bird's basic color scheme. It eats a variety of aquatic foods including grass, seeds and insects. 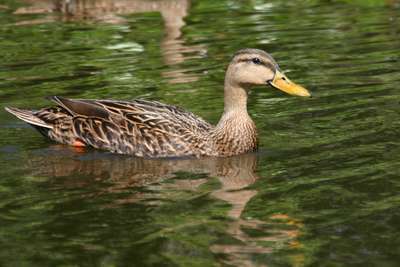 The adult mottled duck is equally at home in freshwater and saltwater marsh areas. Adult Mottled Duck in Ding Darling National Wildlife Refuge (L & M) and Venice Rookery (R).